I went to south Florida for a little Christmas vacation this past week, and to spend some time with Jaimi’s family. All in all, it was a great trip. Full of good times, and even better bargains. I enjoyed an abundance of delicious, home-cooked food - for free. And I got a few pairs of fabulously and deeply discounted designer jeans at the nearby outlet mall. When I tried these jeans on I just knew - it’s as if I was poured into them. Arriving in West Palm Beach, I quickly the noted the convenient location of the rental car counter. Its proximity to the baggage carousel allowed me the benefit of remaining within shouting distance of my travel companion, while I got the rental car and she waited for our bags. Not a bad start. Despite my non-English heritage, the catch never materialized, and the transaction went off as smoothly as clotted cream on a crumpet. I even got an upgrade to full-size for an extra 8 dollars a day. I didn’t want to drive no stinking 4-cylinder vehicle. I need the power of a V-6. 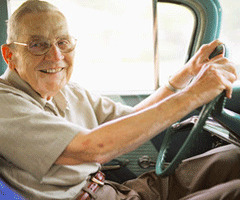 I knew I’d be spending a good deal of time accelerating around slow, elderly drivers, as they meander between two or three lanes at 20 miles per hour on their way to Bingo. Hey Gramps, please try to keep your vehicle on the hard part of the road. Meaning, stay off the grass, and out of the water alongside the road. Also, get out my way when you see the Grand Prix looming large in your rearview! The convenience of the experience only continued, and even increased, as the rental car shuttle picked us up right outside the baggage claim area. A well-groomed driver helped with our bags, even though I tried to do it myself. He seemed an expert at seizing your bags away from you, and scurrying up the two or three steps into the bus. All you can do is follow. The rental car lot was divided into several rows, each one corresponding to a different class of car: Economy, Compact, Regular, Full-size, Grande, Venti, and Minivan. We were given our choice of any car in the full-size row. The keys were waiting. All we needed to do was choose and drive. It wasn’t easy. There was the Chevy Monte Carlo 2-door - a big, heavily-muscled beast of a family sedan in cherry red. 2-door? No thanks. What if we need to transport passengers? Four-doors is more our style on this trip. A Chevy Malibu sat off away a few yards, looking lonely in its copper-colored skin and outdated styling. This was not the new, hot Malibu. This was the old boxy Malibu of potential brake-failure recalls, and surprisingly poor gas mileage. Or something like that. In any case, I hadn’t heard anything good about this car. So we passed. Then it struck me like a debilitating deluge of Mahjong tiles. A shimmering, slightly unusual paint job. Almost like molten chocolate swirled with emerald dust and covered in protective clear coat. It wasn’t exactly beautiful. And it wasn’t exactly interesting, or pleasant to look at. But it was a Pontiac - a Grand Prix to be exact. As anyone born this side of the pond will tell you, they build excitement. Pontiac. We had a winner. One word describes this marvel of high-performance engineering: Totallyawesome. I inserted the key and gave it a twist. The motor fired up immediately. No lag. No hesitation on the part of this powerful beast. The interior was ensconced in a pleasing dark cloth-like material. Obviously durable, and obviously standard attire for this car. It still had that new car smell, which I love. Driving Impressions: The steering wheel of the Grand Prix (pronounced “Grand Pricks”) was unusually large, and took a bit of getting used to. Turning radius seemed to be normal for an unnecessarily large, American sedan. Response and road feel were acceptable. The wheel did not shimmy at highway speeds. So far so good. Starting Impressions: Acceleration was brisk and smooth from a standstill. Jaimi got a little nauseous when I’d accelerate too hard, so I let her off easy and kept it light on the gas. Although the Grand Prix really wanted me to air it out. I could tell it was begging for more action, and would have much preferred that I create a gas pedal sandwich as often as possible - substituting my foot and the floorboard of the vehicle for bread. The pedal being the metaphorical meat, or cheese and veggies if you prefer. Stopping Impressions: Braking was smooth and confidence-inspiring, with very little fade even under repeated hard acceleration followed by hard deceleration. This is all relative of course, as I rarely got over 40 miles per hour, and typically slowed down from 40 to zero over the course of about 2 minutes. Still, the pedal felt nice on the bottom of my flip-flop. Final Impressions: Usually, I beat the hell out of my rental cars, and return them as mere shells of their former selves. But the Grand Prix took what I gave it, and handled it with a smile. The trunk swallowed our luggage easily. It wasn’t too thirsty at the pump. It’s design was inconspicuous enough so as to appear almost invisible to the State Police. 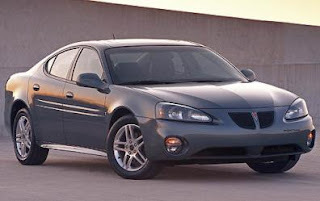 I highly recommend the Pontiac Grand Prix rental vehicle from Alamo.